The Samsung Galaxy Note 5, OnePlus 2 and LG G4 are some of the most powerful phablets in the market right now. They are all high-end smartphones that packs powerful specs under their hood, but how do they fare when put against each other in a speed test? 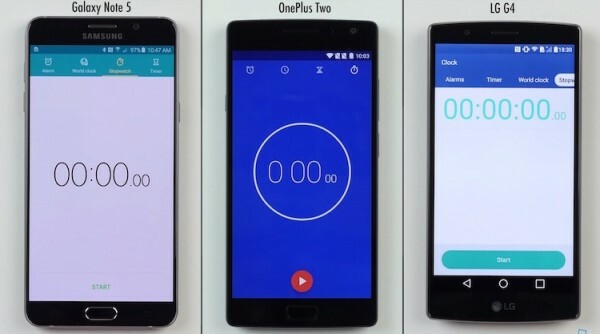 PhoneBuff has a new video that puts these three devices through an app launching speed test. Like its previous videos, the video will see how fast each phone takes to launch a collection of apps. It starts off with a fresh phone with no tasks running at the background. After loading all of the apps, PhoneBuff will load them again to test the multitasking speed of each device. The result? We won’t spoil it for you. Of course, there are more to a phone than how fast it takes to launch an app. But for those of you who are curious just how a top-of-the-line Samsung Exynos 7420 octa-core processor paired with 4GB of RAM performs against a similar range Snapdragon 810 octa-core processor with 4GB of RAM, and a slightly less powerful Snapdragon 808 hexa-core processor with 3GB of RAM, this is a great video for that. Check out our previous post for a specs comparison of these three latest flagship phablets, along with other flagship Android smartphones in the market.